One summer morning about two years ago, on what was to become a very hot day, I was on one of my typical hunting and gathering missions at my favorite weekly flea market. I had already been through the market once and didn’t find much to get excited about so I decided to go back a second time to see if I had missed something. My second round wasn’t yielding much either until I went into a booth that I had skimmed through before and noticed a Donald Duck wall decoration that looked like something I thought Amy might like. I picked it up and began examining it more closely. The devil is in the details as they say and the closer I looked at the details of this piece, the more excited I was starting to become. I asked the dealer the price and was pleased to hear that it was only $20. I also asked the dealer if he had any idea where it came from and all he could tell me is that it came out of a house sale in North Jersey – not much help there. What I noticed that I thought was unusual, among other things, was that it was in an asymmetrical frame. Now if you think about it – making an asymmetrical frame is not the easiest thing to do. Whoever did it would have to be a pretty good carpenter. I also noticed that the background was painted using an airbrush along with hand painted details. That’s not the easiest thing to do and certainly not typical of a mass produced decoration. The most obvious part, of course, is Donald Duck himself and his furry friends, who are getting Donald all tangled up. This was all hand done and carefully cut out perfectly in every detail. It is also beautifully painted by what I suspect was animation paint. 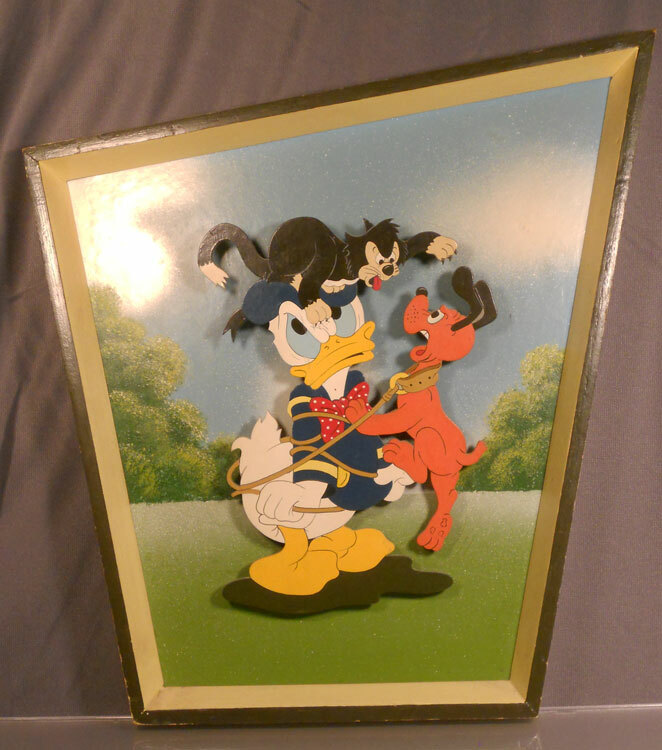 Donald is mounted about a half inch in front of the background giving the piece a three dimensional effect. Also, every Disney piece I have ever seen is marked with a copyright – and this is not. Here is a close up of some of the figures. Notice the incredible jigsaw work around the dog leash and small detailed areas. Also, notice the airbrushed background. The paint on the figures has extremely fine detail, and the paint job has next to no brush strokes. 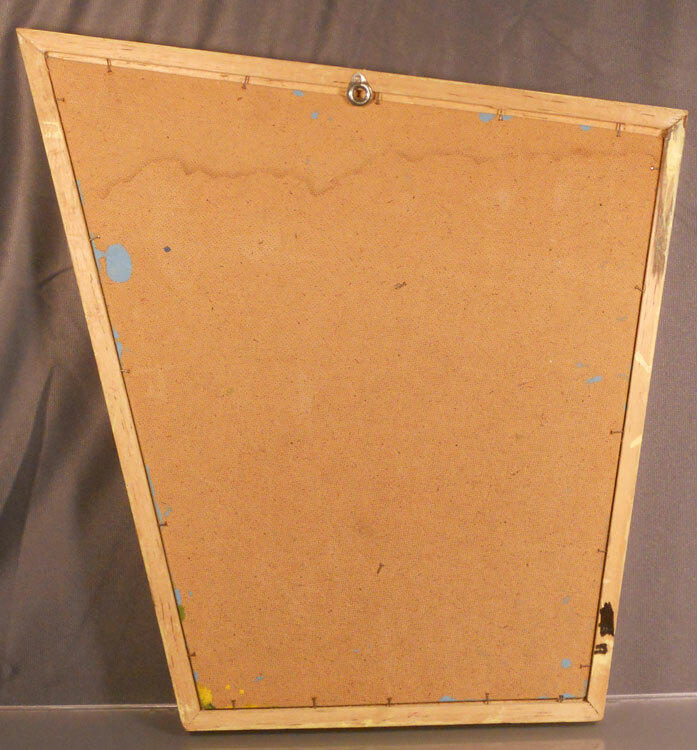 The back of the piece has no markings to speak of, which is very unusual for a Disney piece. There is sloppy paint and ink on the back of the piece, which suggests that this piece was never meant to be sold to the public and that this piece was in no way mass produced. It truly is a mystery piece. So what have I found? Well I still don’t know exactly. 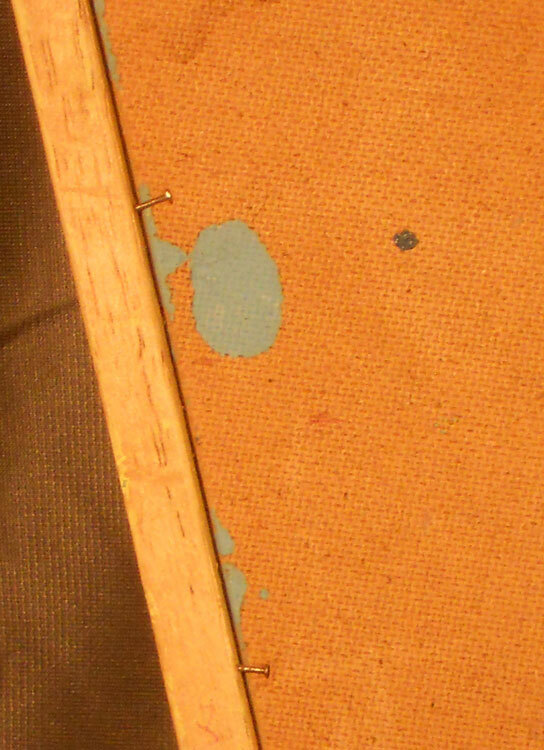 What I think I have found was something created in house at Walt Disney Studios to be used as a wall decoration possibly at the Walt Disney Studios or somewhere else with strong Disney connections. It could have simply hung on the wall in an office or hallway or possibly been some sort of decoration at Disneyland. The artwork also reminds me of cover art on the Donald Duck comics of the era. Some connection there perhaps – who knows? Whatever it is, it is one of the coolest Disney pieces I have ever found. I would be thrilled to hear from our readers if they have any ideas about this Disney mystery. 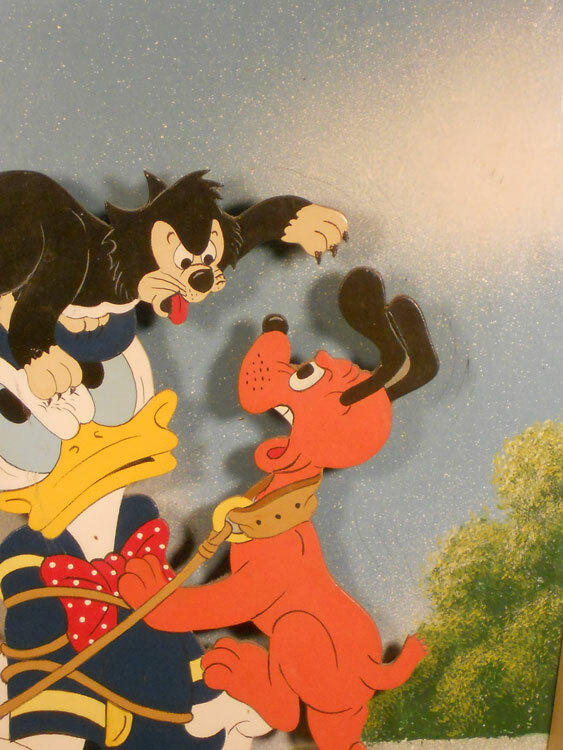 This entry was posted in 1950's, Americana, Art, Disney, Hand Made, Humor, Jim. Bookmark the permalink.